With the advances in medical science and research, the modern academics are vigorously engaging with the development and discover of new technology which can be imbedded into society, furthering medical care and improving lives. Currently, Hiden along with MIMIT, Manchester University and the Manchester University NHS Foundation Trust (MFT) trust have are in collaboration with the focus of non-invasively measuring biomarker compounds in human breath. Focusing on monitoring cellular wellbeing for the real time diagnosis of diseases, such as sepsis, and real time feedback for therapeutic guidance. The biomarker compounds selected to be of most interest are Volatile Organic compounds, or VOC for short, are carbon-based chemicals which are present in blood plasma at concentrations of low % to ppb levels. VOCs act as biomarkers for cellular events brought on by disease, physiological stress or biological event. Using a sensitive, real time, mass spectrometry (MS), the end goal of the project is to implement a bedside monitor into every NHS hospital. This device will be able to provide real time analysis of changes at the cellular level of high-risk patients. With this technology, NHS medical staff will be able to monitor the VOCs contained in exhaled breath of their patients allowing them thoroughly understand the magnitude of the metabolic effects and most importantly receive a warning of any imminent cellular changes such as disease progression, and to guide therapies. During the first phase of the study, one of Hiden’s keen cyclists and Special Projects Manager, Dane, was invited to participate in the development. 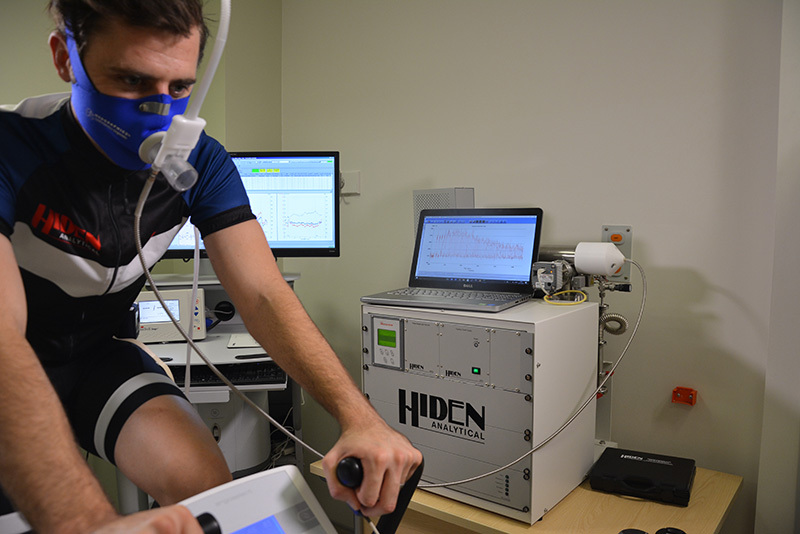 In order to mimic the physiological disturbances exhibited in critical illness, pilot investigations will be in healthy volunteers undertaking extreme exercise. It is hoped that a library of candidate biomarkers in exhaled breath will be identified for future use in the clinical setting.